What is sputtering? Essentially, sputtering is a means of depositing a thin layer of material on a surface. In English, the phenomenon is known as sputtering, in German as zerstäubung, in French as pulverisation and in Russian as raspilenie (разбрызгивание). It is performed within a vacuum environment. Such an environment provides two particular benefits. Firstly it allows for the removal of air and replacement with an un-reactive gas (typically Argon). It also reduces the space between molecules so that they can travel further without colliding with one another. Technically the distance each molecule can travel between collisions is known as the mean free path. So what do we mean by vacuum and how crowded an environment is it? We can consider various degrees of vacuum. Terms such as rough or low, high, very high are referred to. These tend to be general terms. The table below provides general guidance; an atmosphere is about 100,000 Pa.
At atmospheric pressure, the air we breath contains a mind-boggling number of molecules. A mole (a mole is a base unit of the International System of Units (SI)) of gas occupies 22.4 litres and each litre (US Quart) contains 6.02 x 1023 molecules. So each litre of air at standard temperature and pressure (ie a standard or average normal conditions) contains (6.02 x 1023)/22.4 = 2.7 x 1022 molecules. The mean free path of air molecules at atmospheric pressure is about 1 x 10-7m (1 ten millionth of a metre) and the recombination rate, following ionisation events is much too high to establish a steady state plasma. This is a very large number, that can be expressed as 300 quadrillion (short scale) or as 300 billiard (long scale). Even under these vacuum conditions, from a numbers viewpoint, the space remains a very crowded environment at sputtering pressure. With the number density of molecules reduced to this level under the influence of an electric field, it is possible to dissociate electrons from the molecules. This produces what is described as a non-equilibrium plasma, which is characterised by charged species with far higher kinetic energy than the surrounding neutral species. Now consider this plasma held within some boundary; for example, an earthed metal box. The box has a pump to maintain the vacuum level and a gas inlet. By balancing the pumping speed with the gas delivery we can achieve a steady state pressure of 1 Pa. Within this box there is an electrode. The design of the electrode allows to apply a high voltage. When we apply a high voltage to the electrode we can form a glow discharge (plasma). The glow, the colour of which is characteristic of the gas/es in the box, results from the radiative recombination of ions and electrons. 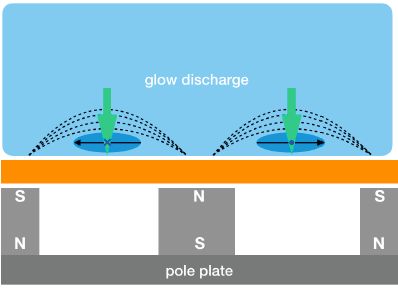 If we were to look closely at this glow discharge in the regions close to the walls of the box and the surface of the electrode we would see that there is a small layer immediately in front of the walls that does not glow. These regions are known as dark spaces, or plasma sheaves. Across these dark spaces there is a potential drop. At the electrode (eg -500 V) ions from the glow will be accelerated across the dark space and strike the electrode with substantial energy. This bombardment energy is sufficient to knock material off (sputter) the electrode. If, for example, the containment box were steel and the electrode were aluminium, aluminium would be transferred from the electrode to the inner walls of the box. Since the gas in the box is air and contains N2 and O2 the actual film that is deposited on the walls may contain a mixture of aluminium oxide and nitride. The electrode can be configured to accept a target of almost any desired solid material. In practical sputtering applications, the air is replaced with a noble gas, normally Argon. This allows pure materials to be deposited. The process of material ejection is by fairly complex momentum transfer mechanisms within the matrix close to the surface of the target material. The bombarding ions incident at the electrode surface give rise to a collision cascade. This results in some recoil energy, which close to the surface, results in material ejection. In essence, it is a physical process and this explains why sputtering is often referred to as Physical Vapour Deposition (PVD). The number of atoms ejected from the surface per incident ion is called the sputter yield and is a measure of the efficiency of the sputtering process. Prior to the commercial development of sputtering the most common technique of depositing high quality thin films was vacuum evaporation. In this process, the material is heated to provide an evaporative material flux which arrives at the substrate to be coated with the latent heat of evaporation of the material. The latent heat of evaporation of a liquid means the vapour carries a great deal of energy, which is why steam causes far more serious scolding that hot water alone. In sputtering the target material is not melted and is transferred directly from the solid to the vapour state, therefore the minimum energy with which material is ejected is the latent heat of sublimation. There are other factors that influence the energy of the material flux. The key point is that it exceeds that for the latent heat of evaporation. In practice, the energy of the arriving material flux can be between 5 to 20 times greater than achieved by evaporation. Ability to coat large areas uniformly. Ease of deposition of dielectric materials. There are several sub-categories of the sputtering process. We shall start with a basic division, Direct Current (DC) and Radio Frequency (RF). This relates to the high tension power supply used to drive the discharge and provide the ion acceleration to the target. When sputtering was first commercialised DC was used. This cannot, however, be used to deposit dielectric materials. Configured as a DC diode the bias voltage on an electrode can rise very quickly. Above 2 kV the longevity and reliability of the high voltage isolation to the electrode can be compromised. Dielectric material can be sputtered when an RF supply is substituted for the DC. It is common and convenient to use an RF frequency of 13.56 MHz (a band allowed by the International Telecommunications Union). This produces a capacitively coupled discharge. The electric field transfers energy to both the electrons and the ions. A high electron temperature is maintained, due to their superior mobility over the ions, which sustains the discharge via electron impact ionisation of the background gas. When using RF it is necessary to also use an impedance matching transformer between the power supply and the load. This electrically passive device ensures that power is efficiently transferred to the load. The introduction of magnetron sputtering has had a massive effect on the practical applications for sputtering. This introduces magnetic confinement of the glow discharge close to the electrode and greatly enhances the efficiency of the sputtering process. 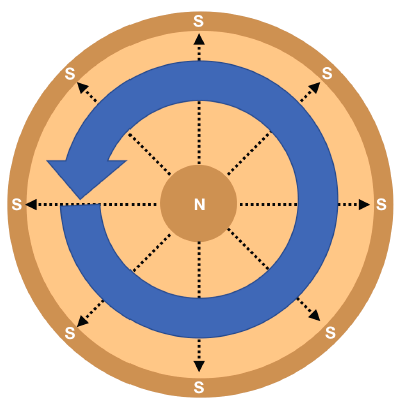 In the simplest form, the magnetron electrode uses a static magnetic field configuration. The magnetic field is formed parallel to the cathode surface. The secondary electrons emitted from the target cathode due to ion bombardment are constrained by the magnetic field. As the electric field and the magnetic field are orthogonal to one another, then Fleming’s left-hand rule for motors demands that the electrons move in a direction orthogonal to both of them, known as ExB (E cross B) drift. With an appropriate array, the magnetic field can be closed and the drifting electrons become confined with what is commonly known as a race track. The target area beneath the race track is then subject to enhanced erosion. In this simplest form, the planar magnetron is commonly available for both circular and rectangular targets. When these apparatuses were first introduced, the types of magnet material available were limited to AlNiCo and Ferrites. Despite this, the planer magnetron quickly emerged as an elegant embodiment of a high-rate sputtering source. The subsequent development and introduction of rare earth magnets, which are far stronger has brought great benefits in terms of what can be implemented within the design of an electrode. The cathode (sometimes also known simply as electrode) assembly consists of the target material, generally 3 to 10 mm thick, bonded to a plate which in turn forms part of the cooling gallery. It should be noted that sputtering is not a very efficient process and much of the power delivered to the cathode manifests as heat. In many designs, the magnet array is wetted by the cooling water. In the Nordiko designs, the magnet arrays is not immersed within the cooling water. The magnet array is mounted on a soft magnetic pole plate and a vacuum sealing plate closes the back of the electrode. The central region of the closure plate, inside of the vacuum seal, allows for the delivery of the cooling water and power. The vacuum seal also incorporates a high tension insulator so that the cathode can be biased by the sputtering power supply. There is also an earthshield, which also serves as an electrical anode. In some arrangements the earthshield can be contrived to be the vacuum chamber wall.